Thank you Provost Inch, and good morning Pioneers. I would like to thank Faculty Marshal Dr. Shimron, ASI President Watkins, Senate Chair Karplus, and Provost Inch, for joining me on the stage this morning. I appreciated hearing your goals and aspirations for the new academic year and look forward to working with each of you. Today I welcome you, the Cal State East Bay community, back to campus. Today’s convocation is my eighth address to the University community, and also marks the official transition to semesters. I want to commend each and every one of you on your hard work and dedication in making this transformation as smooth as possible. We will celebrate this milestone together during a University Hour in the Fall on September 6, but now we are ready to open our doors to our students on Monday! Transformations like these are very invigorating. In reviewing, reshaping and refining the curricula, you have ensured that inquiry, instruction and community service are aligned to fully engage today’s student population. I am proud to work alongside the most dedicated staff and faculty helping our deserving students achieve their dream of a college degree. Last June, we graduated a record number of over 5,000 students, 60% of whom were the first in their families to graduate from college. Everyone here today should be proud of this remarkable accomplishment! Each and every one of you played a significant role in their success. I would like to start by thanking the faculty for all the great work you do for our community. Your’s is an incredible responsibility—as a faculty member in 2018, your work involves teaching, mentoring, leadership and advocacy for your students, as well as conducting research and pursuing scholarship. Mentoring includes experienced faculty coaching and advising new faculty. Over the past few years, I have met new faculty who spoke enthusiastically about participating in discussions centered on their discipline, its past, present and future as part of the semester conversion department planning. The conversations, I learned, were a unique and productive opportunity to share insights with each other. You are truly outstanding! I want to extend a special welcome to the 20 new tenure track faculty members who are joining Cal State East Bay. Each of you made a conscious decision to pursue a career dedicated to improving the lives of the students at our university, which is now your university. I wish each of you success as you begin your professional journey as part of the Cal State East Bay community. We look forward to your contributions in advancing both the University and the success of our students. We have now hired 177 new tenure track faculty since I became your President. I pledged to increase the number of tenured/tenure track faculty from 290 to 350 by this year. As of today we have 341 tenured/tenure track faculty- just short of our goal. While we have not yet reached 350 faculty, the Provost is authorizing as many as 20 additional tenure track searches this year. I want to emphasize again, that the goal of 350 tenured/tenure track faculty was always intended to be a floor, not a ceiling. We will continue to hire and support the faculty we need to ensure our academic excellence and meet the growing demands of our University. I would now like to acknowledge our academic and administrative leaders including the Academic Senators for all the work they do. Many times, they labor unacknowledged and behind the scenes in support of the students of Cal State East Bay. I am extremely fortunate to have the opportunity to work with such talented colleagues. Let’s give them all a round of applause. With us today are two new members of the President’s Cabinet. Dr. Suzanne Espinoza, a distinguished leader in the areas of student services, student success, and enrollment management, began serving as the Vice President of Student Affairs on July 2. A first generation college graduate, Suzanne’s commitment and passion for students and her leadership and expertise in organizational development were evident during her tenure as Vice President for Student Affairs at Cal State Stanislaus. Suzanne holds a doctorate in educational leadership from the University of Utah. We are excited to welcome her as part of our leadership team, helping our students succeed academically and personally here at Cal State East Bay. Suzanne, will you please stand and be recognized? I would like to welcome Kimberly Baker-Flowers, an experienced diversity professional, as the new University Diversity Officer—in fact, this is her first week on campus. Kimberly holds a juris doctorate from Creighton University and joins us after serving as the Chief Diversity Officer and Title IX Co-Coordinator for the Portland Community College District. Her commitment to diversity and passion for social justice and equitable practices make her the ideal choice to serve as our University Diversity Officer. I was particularly intrigued by her concept of “Liberation” as the next pillar of diversity, equity and inclusion, and am confident she will have a positive impact across campus. Kimberly, will you please stand and be recognized? I will now introduce to you the other members of the President’s Cabinet. Will the Cabinet please stand and be recognized. I would also like to recognize other members of Cal State East Bay who have assumed permanent or new administrative and staff roles. I would ask those administrators and staff who are here for the first time or have taken on new roles over the past year to please stand, if able, or wave. Please help me welcome and congratulate these colleagues. Our staff work tirelessly on behalf of the entire campus community in support of our wonderful students. Across all aspects of the university, throughout the year, from welcoming new students moving into the residences (like today) to preparing the buildings for classes on Monday and the grounds for Commencement to providing a range of student services, we have a terrific workforce at Cal State East Bay. Please join me in a round of applause to thank them for their valued contributions that make this one of the most welcoming universities and fosters student success. I would like to introduce my wife, Barbara Hedani-Morishita. She strongly and tirelessly supports all the work and activities that I do and has become a strong advocate in her own right for the students, staff and faculty of the university. Barbara, would you please stand? Matthew Evans, Budget and Data Specialist, College of Education and Allied Studies, and recipient of the Vivian Cunniffe award for outstanding staff employee. I also wanted to offer my congratulations to Dr. Karina Garbesi and Dr. Erik Helgren who are the recipients of the Faculty Innovation and Leadership Award from the Chancellor’s office. We just learned about this prestigious honor this week and will share details about this in the very near future. Congratulations to them both. Fall Convocation is a time when we review the past year’s accomplishments and set the agenda for the next year. While this year has seen dramatic changes both nationally and internationally, I believe it is worthwhile to reflect on what is most important about the work we do in higher education and specifically, at Cal State East Bay. At our core, we are about empowering our students with the education, skills, and life lessons they need to better themselves, their families, and their communities. Like most of you, I began a career in higher education because I wanted to make a difference. I wanted to make a difference in someone’s life--to connect and to let the student know they were seen and heard. I was fortunate to have someone play that role in my own life—a teacher who helped me understand that I could do more and achieve more. For those of you here today or watching this online, I ask you to think back to what it was like to be unsure of yourself when you walked into a college classroom for the first time. Remember that feeling of anxiety when you turned in the first exam, wondering how many questions you answered correctly or, even worse, how you compared to your classmates. As a first generation college student, I recall very well the sensation of not fitting in and wondering if I belonged, especially when I looked around at my classmates. I have often thought about who made it to college and who did not. That feeling of “who belongs” came to mind when I read the news recently about white supremacists marching in Portland and closer to home, in Berkeley. Threats from outside and within continue to rattle us, as we hear once more about efforts to dismantle the Department of Education or as is being proposed, to create one Department of Education and Labor. The debate about the value of a college education continues, with concerns ranging from the cost of tuition to the influence of professors in the classroom. I find it extremely concerning that the detractors of higher education place such low confidence on our students’ ability to think critically and analytically for themselves. At Cal State East Bay, we work hard with our students to develop those skills, as well as foster problem-solving, working in teams, and respecting diverse ideas, perspectives and people. I want to make clear some of the work I see ahead of us. People say a college education isn’t for everyone and I think most of us would agree with that statement. But when people say it isn’t necessary to go to college to succeed, we need to think carefully about who is delivering the message and to whom that message is meant for. In Congress, nearly 100% of its members have college degrees—in the House of Representatives, only 5% do not. We need to consider who is being disenfranchised and disempowered when told college is not for them. A college education is and should be touted as a public good, not a private one. To put it plainly, higher education has helped me get to where I am today. Higher education has helped all of us here in this room and those of you watching online. Cal State East Bay provides our students with a college education and they in turn, improve their lives and that of their families and communities. We are working together towards the goal of empowering our students to return to their communities to work in schools and colleges, non-profits, businesses, governmental agencies and establish their own companies. By each of us contributing towards a welcoming campus, with engaging curriculum and friendly, efficient service, we are ensuring our students know they belong and can succeed. Our students are in the right place at Cal State East Bay, and I’m proud to serve them with each and every one of you. We are educating and graduating truly outstanding students and I am pleased to share some highlights from the past year. First, I want to acknowledge the academic achievements of our athletic teams. Often, we hear about our student athletes’ hard work and discipline in athletic competitions, but I wanted to share with you that the same hard work and discipline led to impressive academic success in the classroom. In 2017-18, across the entire academic year, every single team at Cal State East Bay had a collective grade point average of at least 3.0, the first time in our history that has happened. Collectively, Pioneer student-athletes posted a 3.249 grade point average in Winter quarter, the highest on record. They also contributed 1,144 hours of community service – a remarkable accomplishment in addition to the time spent practicing and studying. Congratulations and thank you to our coaches and staff for leading our Pioneers to excellence. Our culture of service learning has matured over the years and last year, over 1000 students participated in Freshman day of service, providing over 3400 hours of community service. Cal State East Bay and the City of Hayward also collaborated on a “Book to Action” grant which used the common read novel, “In the Country We Love: My Family Divided” by Diane Guerrero, as the basis for community forums and book discussions about immigration. Everyone benefits-- students, faculty and staff and the city of Hayward—from opportunities to deepen our conversations and relationships. In June, ASI officer Alex Goelzer graduated with a degree in political science. He is the first Cal State East Bay student in at least 20 years accepted into the Executive Capital Fellowship program in Sacramento. Alex will experience California state government first hand and attend public policy graduate seminars. After overcoming an earlier life of substance abuse and homelessness, Alex transferred to Cal State East Bay and credits the university and his professors for pushing him to succeed academically and professionally. A 2012 graduate of ours, Lucy Ogbu, has a tremendous story of perseverance. Born in rural Nigeria, she arrived in the United States at age 11 and after a childhood of abuse and neglect, managed to fight for her education. She entered Cal State East Bay and despite experiencing truly challenging circumstances, graduated with a degree in Biological Science with the dream of going to medical school. Lucy persevered and I am pleased to announce that in June, she graduated from UC Davis as an MD in psychiatry and is headed to a residency at Harvard Medical School and Massachusetts General Hospital. What an accomplishment for one of our Pioneers. In the Fall, Chidimma Obioma will participate in the national Newman Civic Fellowship, a program of Campus Compact which recognizes outstanding students taking on leadership roles in their communities. A nursing student and member of Pioneers for Change, Chidimma described how she has “truly discovered her interest and potential in serving the community on a much greater scale” through her work in this campus program. After graduation, Chidimma plans to work towards eliminating health disparities and promoting health equity and access. Let’s take a moment to acknowledge all of our remarkable students! Our university community of faculty, staff and administrators working collegially and collaboratively, has strengthened our institution and supported the success of our students. By working together, we fulfill our mission and promise to our students and our community. This is not always easy and there are times when we have disagreed on various issues. But we can and have agreed that it is okay to disagree. We express our views and then we move forward, united in the goal to provide a quality education to our students. There is no better example of this than the completion of Semester Conversion. In the four-year process of transitioning from quarters to semesters, our students, administration, staff and faculty and, in particular, the Academic Senate undertook the enormous task of adapting and refining our curriculum, policies, and processes to enhance our students’ opportunities for success. The fifteen week term now allows students time for course correction if needed, deeper engagement with their professors on research and course projects, and provides a smoother transition for our community college transfers. Many of you here today participated in this monumental undertaking—possibly the most comprehensive effort since our establishment as a university 61 years ago. The Semester Conversion Steering Committee has led our campus steadily and successfully throughout this complex process and I thank them for their efforts. I would ask those of you here today who worked in some way on Semester Conversion, please rise and be acknowledged. As we begin this new era in Cal State East Bay’s history, I would like to take a moment to acknowledge the important role of the Academic Senate in fostering collaborative and collegial decision-making and prioritizing respectful deliberation. I remain committed to expanding the understanding and importance of the role of shared governance here at Cal State East Bay. Our university will always face challenges, some when we least expect them, yet I am convinced that together we are committed as a community to rise to the occasion. Semester conversion stands out as one example of such work. At Cal State East Bay, faculty, staff, students and administrators served together on committees, made recommendations, and developed policies. Working groups, teams and committees representative of the divisions, colleges and departments worked hard together in the interest of our students.. Through my meetings with the Academic Senate and its Executive Committee and in monthly faculty coffee hours among many other events, faculty provided both formal and informal recommendations to me as president of the University. Although the CSU Board of Trustees and Chancellor have charged me with the responsibility, authority and accountability for the operations of our university, the university cannot function without the dedicated, active participation of all its members. Our collective success depends on our ability to work, govern and advance the university together. By being engaged in meaningful and collegial dialog, we model to each other and to our students that we are engaged, that we care, and that what we do matters. Each of us has a role to play in providing a safe and dynamic learning environment and I am appreciative of how the university community has worked collaboratively in service of our students. This year, everyone in the CSU worked together – trustees, administrators, faculty, staff and students – to convince our state legislators and ultimately the governor that the CSU matters for the civic and economic well-being of California. For the first time ever, the CSU system has a permanent general fund allocation greater than that of the UC system. In the 2016-17 academic year, the CSU enrolled 44% more students and saw 40% more graduates complete their degrees than the UC. Yet, the CSU is forced to do this with less funding per student. While the budget allocations were better than what the Governor had proposed, the CSU still did not receive enough permanent funding to cover all of our mandatory cost increases. However, with prudent budget expenditures, Cal State East Bay will have the same resources available to serve our students on a one-time basis as we did this past fiscal year. Congratulations to all of us for working together so hard for our students and the CSU. Every student who walks across our stage is a success story and last year, we graduated the largest class in the history of Cal State East Bay, with over 5300 degrees awarded. This was a 13% increase over the prior year. Some of you might be able to guess at the reason for the bump in our graduation numbers. Regardless, we should take great pride that about one-third of our total student body graduated and are going out and making a difference in their communities and the world. We begin the Fall Semester with a healthy enrollment of undergraduate and graduate students that I hope equals our enrollment last year. Due to our 2017-18 graduation success, we have fewer continuing students and need more new students to keep our enrollment robust. As has been the case since 2012, we admit a very limited number of students by exception and will continue to do so. Students now entering the university are better prepared than in the past. To do otherwise is a disservice to those brought in academically unprepared and would be unfair to the faculty and staff needed to help them succeed. I am now pleased to share some of the notable accomplishments from the past year which will positively impact our students, our campus, and the community. The Hayward Promise Neighborhood program was awarded close to a $30 million dollar grant from the U.S. Department of Education—bringing the total funds received to nearly $55 million dollars. In part due to these efforts, the graduation rate in the Hayward Unified School District has shown an increase from 76% to 89%--meaning more students are better prepared for the future and to attend Cal State East Bay, or another college. Our local impact has also been recognized by the National Science Foundation, which awarded a $3.4 million grant entitled “Science Communities of Practice Partnership”. Over 100 teachers and administrators across four school districts will receive critical professional development and the investigators will examine how to sustain professional development improvement in science teaching. This year, we congratulate the College of Business and Economics and the College of Education and Allied Studies for their successful reaccreditation. Preparing for an accreditation review is an enormous task and I am appreciative of the efforts by the deans and faculty and staff in their colleges in achieving this accomplishment. Starting this year, as a commitment to active faculty scholarship, we are piloting a program to extend the research assigned time probationary faculty receive in their first two years, to all of their probationary years. Our hope is that this will help our new faculty firmly establish their research agendas and elevate their participation in their disciplines and work with our students. We hope to extend this opportunity to senior faculty and will keep you informed about the status of this effort. We continued to build ways to enhance student success as we opened the office of university internships, housed in the SF building. The office supports college efforts by acting as a clearing house for internship opportunities, a point of contact for potential employers, and ensuring that students are prepared for their placement. The impact of Project HOPE continues to grow, as student visits to the three pantries increased 55% over last year. The donation of meal swipes was highly successful with 3855 meals given to students. A new partnership with Swipe Out Hunger, a national organization committed to ending hunger on college campuses, should expand our success and efforts in this area. To further our understanding about food insecurity, the Stupski Foundation has awarded a $400,000 grant to investigate this and other needs of our students. Thank you to our student affairs and academic affairs teams for their leadership in this arena. Staff, faculty and student support for programs such as this make me proud and I believe our community support strengthens our University as a whole. Last year I introduced you to the CORE Building, the future home of the library, the Student Center for Academic Achievement (SCAA), and the hub for programs focused on innovation and entrepreneurship. This building will house “library services” that support our students’ connection with the knowledge of their disciplines. It will provide them with programs and services that take learning beyond the classroom with opportunities for cross disciplinary, creative, and collaborative projects. The CORE is designed as a destination for student inquiry, ideation, team projects, and research that can inspire and influence their future careers. I am both impressed and proud of the campus-wide effort to program and plan for a facility designed around and dedicated to the learning experience. And, I am pleased to report that progress is continuing with this vital project and as of now, the CORE building is on schedule to break ground April 2019. In addition to the CORE Building, planning is underway for The Applied Sciences Center - a facility designed to support student and faculty collaborative research. The Center will expand the space for interdisciplinary research projects, include flexible classrooms for active learning and collaboration, and feature an innovation center – a signature space that will allow students to explore application of new technologies to real world problems. Planning and design work for the Center is in progress, and we expect the preliminary schematic design to be ready soon. The entire university community has been working towards achieving the goals set by the Rising in the East campaign. I am pleased to announce that in collaboration with many members of campus, University Advancement has raised more than $20 million this year. This is the first of its kind in the history of the University! Many of the funds raised will support capital projects, student scholarships, strengthen student-faculty research and enhance faculty partnerships in the community and region. In addition, this year’s donor gifts—including those from staff, faculty, alumni and students-- increased by 34%. A large reason for that success was the new Senior Class Gift campaign – where nearly 20% of the graduating class of 2018 contributed almost $18,000 to the University. Thanks to $5000 in matching funds from both Associated Students and the Alumni Association, this raised the total to $28,000. As I have stated in the past and would like to reiterate today, all of us have a role to play in building upon our philanthropic success in supporting our outstanding and deserving students. Thank you all for your continued efforts in this important endeavor. As we have heard, there is more work to be done in ensuring our students have access to college and the ability to pursue their academic and professional opportunities at Cal State East Bay. Unfortunately today, we often hear reports that the American Dream is nearly impossible to achieve. In the last 50 years, the percentage of children earning more than their parents has dropped from 90% to 50%. As a result, there is renewed attention on how the American Dream can be revived for future generations. Importantly, one variable that investigators report and what many of us know -- is the necessity of a college education in the upward mobility equation. A recent study showed that higher education deserves acknowledgement as an engine of mobility. In this report, two public institutions, the California State University and State University of New York systems, demonstrated the highest bottom to top mobility rates when comparing family income and later earnings. That is even when compared to highly selective institutions. The study indicates that 44% of the graduates from Cal State East Bay moved from the lowest income quintile as students, to the top fifth as adults. Out of 369 selective public colleges across the nation, our university ranked 16th. This is truly impressive. In the CSU, 60% of our students do not pay for tuition; however, as we know, there are additional costs of pursuing a higher education. 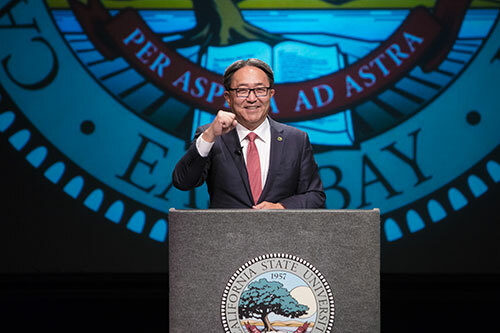 At Cal State East Bay, we awarded $135 million in financial assistance to our students and I am pleased to report that $71 million were in grants and scholarships. To keep college within reach, we need to keep investigating ways to make books, housing and transportation affordable. A Cal State East Bay education remains worth the investment and we can each do more to share that message. So, where do we go from here? You have now heard about the accomplishments of our students, the dedication of our staff and faculty and the challenges we face, and ambitious goals for the future. To this end, I am asking each of you to do two more things this year. We owe it to ourselves and more importantly, to our students, to stand up for the value of a college education. Higher education has never been more scrutinized or criticized than in recent years. If we are passionate about continuing our work to get our students across the finish line, then I ask you to have these conversations with your families, your friends, and your communities. Each of us has a story to tell about how Cal State East Bay is a place where students belong and thrive. To prepare our students to be active, contributing citizens in their communities, the Bay Area and beyond, I ask each of you—staff, faculty and administrators--to do the following. Before the general election on November 6th, make a pledge to talk to five students about the importance of participating in our democracy. If we believe in the importance of civic learning and engagement, then let us support President Watkins and ASI in their efforts to empower their classmates and get out the vote. The deadline to register to vote in California is October 22nd and can even be done online. We can do more to help our students understand how to exercise their power at the polls. Our college, our city, and our country can only be strengthened by their voices. Let Cal State East Bay show them the way. I am very excited about the coming academic year. We have much to look forward to with our freshmen born in the year 2000, the start of the University Hour, refreshed and transformed programs, and recharged, rejuvenated faculty and staff. Being the President of Cal State East Bay is the most rewarding job I have ever had. And all of you have helped to make it so. I wish you a productive and great year! Thank you and Go Pioneers!